AMHP is a national non-profit organization focused on professional development and empowerment of health professionals seeking to advance public health, social justice, and civic engagement within their communities. Exploring Islam's contribution to public health has been an astounding journey for me. Working across the Middle East, Africa, and South Asia in Muslim majority countries, I'm amazed at not only the history of Islamic theology in contributing to our modern day understanding of public health, but also its potential to improve its practice. Yet, what is puzzling is that very little attention is given to the relationship between Islam and public health, especially in academia. Practices of good hygiene and nutrition, disease prevention, and infectious disease control-- recognized as hallmarks of public health today, were supported over 1400 years ago through the teachings of Islam. The impact of Islam and medicine is documented in the life and scholarly contributions of the likes of Ibn Sina, Al-Razi, Ibn al-Nafis, Ibn Zuhr, and al-Zahrawi (Albucasis), as well as in European medieval texts that utilized their works. 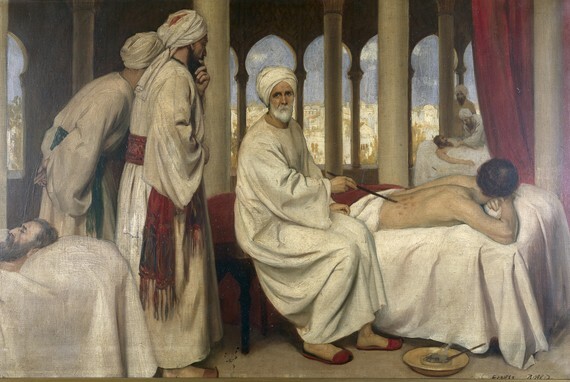 While the 14th century Arab polymath, Ibn Khaldun in his renowned text Muqaddimah, recognized that "God did not send the Prophet Muhammad to teach us medicine but to teach us religious law," it is from within Islam's spiritual foundation and mandate to pursue knowledge that scientific thought flourished(1) and advances in public health can be traced. Perhaps more than any other intervention, none has been simpler and more effective than improving sanitation and hygienic practices. Improving poor hygiene, inadequate quantities and quality of drinking water, and lack of sanitation facilities prevents many communicable diseases and has helped increase life spans across the world. Matters of nutrition were often mentioned as well. Islam teaches Muslims the importance of moderation in eating and drinking. The Prophet Muhammad went so far as to recommend that Muslims keep only a third of the stomach for food, a third for drink, and a third for breath. At a time when a third of the global population lives without basic sanitation and more people die from eating too much than not eating enough, these virtues carry immense weight and align with public health standards of the day. Infectious disease control, a cornerstone of public health, aims to prevent and control the spread of communicable diseases. Among the notable achievements that have defined public health in the 21st century are the development of vaccines, antibiotics, surveillance methods, and quarantine practices. In fact, a large part of my consulting work centers on these methodologies. An example of this is the Ottomans' adoption of the method for smallpox inoculation from the Near East. Passing the knowledge on to Europe in the early 1700s, Ottoman Egypt-- facing a smallpox outbreak--began their eradication efforts after seeing the benefits of the vaccine. Where faith and science were at odds in much of the West, Prophetic traditions from the same era relay to us that Prophet Muhammad taught that, "For every disease, there is a remedy, and when the remedy is made apparent, the disease is cured by the permission of God. "(8) As a result, early Muslims thinkers, physicians, and scientists were encouraged to advance their understanding of health and disease with a focus on preserving good health, avoiding what harms the body, and detoxification, utilizing and building upon the best practices of the day. Early Islamic thought also supported quarantining of patients. The Prophet is reported to have said: "Do not let those infected transmit their disease to those who are healthy"(9) and "[i]f you know that plague is raging in a specific land do not enter it and if it happens in a land where you are, do not seek it." (10) These were practices that did not spread to the West until the eighteenth century when merchant ships were quarantined by refusal to dock until some predetermined time had passed, and not codified until the twentieth century when the International Sanitary Regulations were adopted (11). At a time when Islam is increasingly misunderstood and politicized, it is important to remember the positive impacts. Practices of good hygiene and nutrition, disease prevention, and infectious disease control revealed through prophetic tradition-- and essential elements of public health today--are just a reminder that Islam was revealed as a comprehensive way of life, that even extends to public health. Considering a globalized world, where many lack basic access to clean water and sanitation, raging epidemics of obesity and malnutrition, and emerging and re-emerging infectious disease threats, Islam has much to offer, not only to Muslim communities burdened by these public health concerns, but also the global community as a whole. The challenge for Muslim practitioners in public health is to utilize these teachings in a way that will motivate local populations and activate policy implementations. Without proper education, it is impossible to promote public health awareness, and religion is a key tool in these efforts as it posits a readily available foundation for good public health practices. Conversations on public health policy requires that public health practitioners bring into practice theological teachings, both in academic conversations as well as practical policy implementation. By doing so we can more fully embrace the prophetic traditions handed down to us. Affan T. Shaikh is a guest contributor to the American Muslim Health Professionals Huffington Post column. Affan Shaikh, M.P.H., is a public health professional with interests in global health, disease prevention, and technology. His work engages multilateral stakeholders including inter- and intra- governmental organizations, academic institutions, NGOs, and communities to build local public health capacities. As a consultant, Mr. Shaikh has worked on the ground in the U.S., Africa, South Asia, and the Middle East, with long-term engagements in the Kingdom of Saudi Arabia during the peak of the 2014 MERS-CoV outbreak. He is currently supporting post-Ebola public health capacity building in Sierra Leone and Liberia. His most recent book, Transforming Public Health Surveillance, explores the governance, collaborations, informatics, and analytical capacities required to prevent, detect, and respond to emerging and reemerging global public health threats in the 21st century. He can be tweeted at @AffanSheik. 2- Muslim, I. Sahih Muslim Volumes I-IV. Translated Muhammad Muhsin Khan, Al Saadawi Publications, 1996, Book 002 hadeeth 432. 3- Al-Bukhari MI. The English Translation of Sahih Al Bukhari With the Arabic Text (9 Volume Set). Translated by Muhammad Muhsin Khan, Al-Saadawi Publications, 1996, Book 72 hadith 777. 4- Narrated by Muslim following Abu Huraira. 5- Narrated by Ibn Majah following Abu Bakr. 6- Narrated by Al-Tirmidhi following Abdullah ibn Mihsan al-Ansari following his father. 7- Authenticated by Al-Khatib in his "History" following Abu Huraira. 8- Al-Bukhari MI. The English Translation of Sahih Al Bukhari With the Arabic Text (9 Volume Set). Translated by Muhammad Muhsin Khan, Al-Saadawi Publications, 1996, Book 25, hadeeth 5466. 9- Narrated by Al-Bukhari and Muslim. 10- Authenticated by Al-Bukhari following Usama ibn Zayd. 11- Howard-Jones, N. "The scientific background of the International Sanitary Conferences, 1851-1938." WHO Chronicle, 1974. Available at: http://apps.who.int/iris/bitstream/10665/62873/1/14549_eng.pdf.